August 20, 2018 – Visalia, Calif. – New regulations are expected to cost California citrus growers an average of $701 per acre per year, or $203 million annually statewide, according to a new study commissioned by the Citrus Research Board (CRB). “Babcock, has presented a well-researched economic report that shows how new regulations will increasingly impact California's citrus industry,” said CRB President Gary Schulz. The report, Impact of Regulations on Production Costs and Competitiveness of the California Citrus Industry, also predicts that controlling the Asian citrus psyllid (ACP) “will increase costs by $65 million, or $248 per acre per year, if controls are extended to all citrus-growing regions.” Compliance training costs are estimated to increase costs by another $29 per acre, or $7.5 million for the state citrus industry. The 20-page report includes a breakdown of increases in labor costs, including California's minimum hourly wage increases, which are scheduled to rise in annual increments to $15 over the next four years. The report also covers the projected cost increases of recent state legislation dealing with paid sick leave, payment rates for rest and recovery periods, overtime and workers compensation. The section on insecticide treatment addresses grower cost of spraying for ACP, even though the severity of the problem currently differs greatly in various areas of the state. If ACP establishes itself in all citrus regions in the state, which the report says is “almost inevitable,” control efforts would amount to $39.5 million per year, according to Babcock. This would be in addition to the state-mandated tarping of fruit that is transported to packinghouses, at a cost of approximately $9 million per year. According to the report, The Food Safety Modernization Act, which was passed in 2011 and is still being implemented, will not require major changes for growers who are already GFSI-certified (Global Food Safety Initiative compliant). Babcock, a Fellow of the Agricultural and Applied Economics Association, has won numerous awards for his applied policy research. He received a Ph.D. in Agricultural and Resource Economics from the University of California, Berkeley, and Master's and Bachelor's degrees from the University of California, Davis. 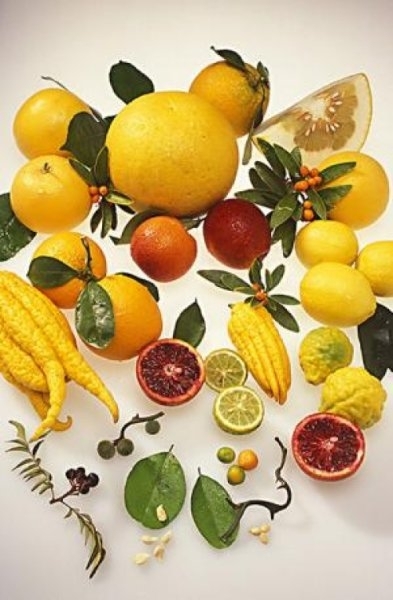 The CRB administers the California Citrus Research Program, the grower-funded and grower-directed program established in 1968 under the California Marketing Act, as the mechanism enabling the state's citrus producers to sponsor and support needed research. The full report on the Impact of Regulations on Production Costs and Competitiveness of the California Citrus Industry, as well as more information about the Citrus Research Board, may be read at www.citrusresearch.org. Commercial-scale production of blueberries in California is a relatively recent development. California first reported blueberry statistics in 2005 when there were 1,800 acres of blueberries harvested and production of 9.1 million pounds with a total value of $40.58 million. Harvested acres increased to 3,900 acres in 2010 with production of 28 million pounds and a total value of $75.98 million. Growth continued through 2015 with California Agricultural Statistics Survey (CASS) reporting 5,700 acres of blueberries harvested, production of 62.4 million pounds, and total value of $116.98 million. California blueberries are shipped throughout the U.S. and to a number of export destinations. During the 2016 harvest, California's largest U.S. market was California, which accounted for 34.75% of California's total fresh blueberry shipments of 46,493,407 pounds. The largest out-of-state domestic shipments were to Texas, Oregon, Washington, Arizona, New York, Minnesota, Utah, and Pennsylvania. These states collectively accounted for 36.54% of California shipments. Canadian shipments of 5.54 million pounds accounted for 11.9% of California's volume and made up 67.1% of exports. Typically, the price per pound of organically grown blueberries is higher than for conventional production. Prices also vary by package size, with smaller package sizes usually selling for more per pound than larger packages. There is usually a premium for the first portion of the crop-marketing year, and the overall level of prices will vary by year. Prices can also be expected to vary by geographic location. California organic blueberries are among the first domestic fruit on the market when prices tend to be seasonally high. Growth in California organic blueberry production has outpaced conventional production for several years, and California accounted for about half of the U.S. supply of organic blueberries in 2014. The organic share of California blueberry shipments in 2016 was 23.1% in terms of volume and 34.8% in terms of value. The larger share of value is due to the premium price for organic blueberries. The organic premium, which averaged $2.28 per pound in both 2015 and 2016 (78–79% of the conventional fresh blueberry price), varies by package and over time. 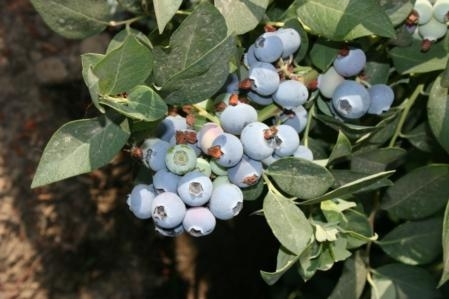 California has some of the earliest domestic blueberry production, with relatively high prices for both conventional and organic blueberries at the beginning of the season. The proportion of shipments that are organic decreases as the season progresses and the organic premium tends to be highest after the first one-third of the season. The growth of organic blueberry production in California, relative to overall California production as well as U.S. organic blueberry production, seems to indicate a comparative advantage for organic blueberries in California. Further growth of organic as well as total blueberry production in California is expected.